If you like this tutorial for making a photo quilt, you may also enjoy this free hexagon quilt sewing pattern. I have been trying to make quilts for my nieces (and nephews when they get old enough) when they graduate from High School and head off to college. I liked the idea of a quilt with photos of their family back home on it, to keep them warm if they get homesick while away. After making the previous quilt, I decided I should simplify the pattern a bit. This one is very simple, made up of all 9″ squares of fabric. I picked the fabrics based on the colors of my niece’s dorm room bedding and a few that I thought would be meaningful (like the horses since she is a Kentucky girl). The quilt is simple 8 rows of 6 blocks. I thought I’d share a bit about how I incorporated the photos into the quilt, along with some things that I totally did wrong. I also don’t have a “great” photo of the whole quilt finished, because as much I was excited for my kids to go back to school as soon as they left I realized I had no one to hold quilts for me while I took a photo! The quilt is a simple patchwork quilt. 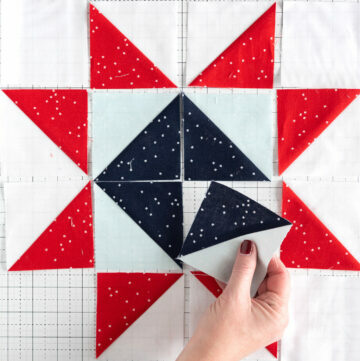 You can use this technique with any quilt pattern as long as your photo blocks are the correct size. 48, 9″ squares of various fabrics – this INCLUDES the photo blocks- subtract the number of photo blocks from the total to figure out how many you need all together. Note: The blocks on this quilt are 9×9 before finishing. Printable fabric does not come 9″ wide so we need to print the photo on the fabric and attach it to another piece of fabric to get it to fit in the quilt. You can ALSO use 8×8 pieces of fabric instead, then cut the squares of your other fabric to 8×8 instead. If you do this, I recommend that you buy non-fusible printable fabric. 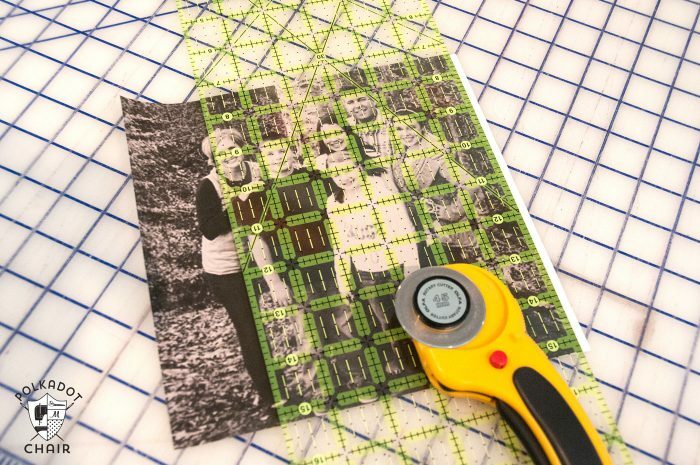 Print your photos black and white onto your printable fabric (you can get it at craft stores). You want your photos print size to be 8″x8″, you’ll need a simple photo editing software to do this (like photoshop elements or iPhoto). Trim your photo down to 8×8 (it prints on an 8.5″ x 11″ size of fabric). Iron your photo onto your white fabric. Press well to heat set the ink- trim this piece down to 9″x9″. TIP: Follow the directions on the package of printable fabric for how to set the ink on the fabric. Each manufacturer is different. If you don’t set the ink it may bleed when you wash the quilt. The ink although set will bleed a bit when you wash it- I found this out too late and thus we have the “vintage” looking photos on my quilt- My 11 yr old daughter said it looked “cool” and there wasn’t much else I could do by that point, so I went with it. The other problem is some of the black ink bled onto the quilt top (augh!!). I wish I had pre-washed the blocks before I stitched them into the quilt. So, at this point, if I were you… I would throw each of the blocks with the photos sewn onto them, in into the wash. Run them on a gentle cycle. Lay them flat to dry (don’t throw them in the dryer or they will shrink and not fit the quilt). 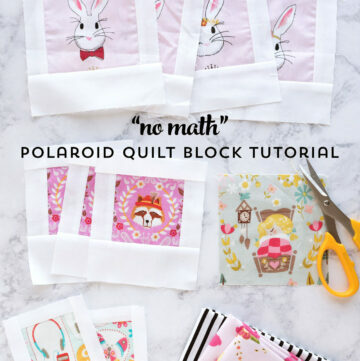 After you’ve completed all of your photo blocks- you simply need to sew your 9″ squares together. Stitch 6 blocks together for row 1, repeat for rows 2-8. When you’re finished stitch the rows together. Quilt as desired (if you want more information about making a lap quilt, you can view my previous posts about it here). When you’re done, you can wash and dry the quilt as you normally would. However, I would recommend a gentle detergent (like Woolite) to help preserve the photos. 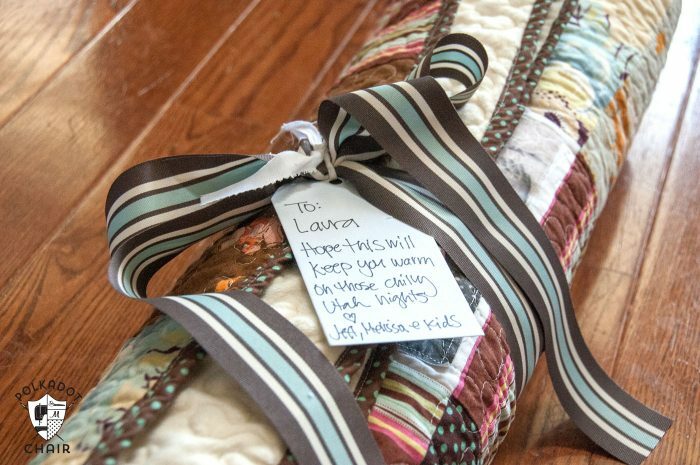 Cute quilt and what an awesome gift to get for graduation. Thanks for the tutorial. i just used photo fabric for the first time… after the fact, another quilty friend told me that whenever she’s used it, it washes out! i’m so nervous to wash the quilt i’m working on (mainly because it’s not for me). my question is- when you set your pictures, did you rinse them with water and then re-set them again? To set the pictures all I did was iron them… a LOT! Then I washed the quilt normally but with no detergent- this is where I found out that the photos bled- my photos faded but were still visible… Maybe throw it in the dryer before you wash it? 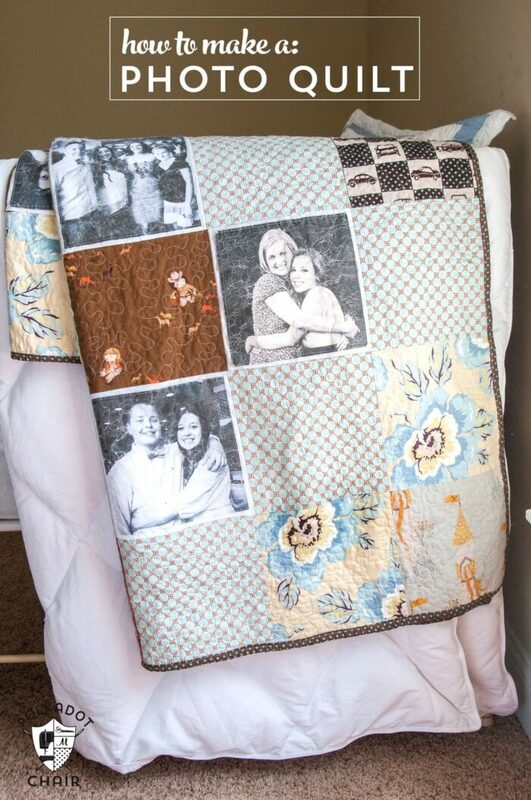 You can have photo quilt squares made inexpensively, that are guaranteed not to fade. I have had great luck with Portrait Quilts (www.portraitquilts.com). They charge $12.00 for photo squares up to 11″ x 14″, but give great deals on smaller photos, especially if you order 10 or more. You can go to their website and ask for a free sample and they will send it to you. This is so cute! I used photos in a duvet cover a made a while back – added a great personal touch! I used a printable fabric product called “Printed Treasures”. This product seemed to work best and after your photo is printed, if the ink is wet, put the photo sheet in cold running water to set the ink then let dry naturally. This will set the ink so that it won’t run. I’d like to suggest a better way to print photos. There is a product called Bubble Jet Set 2000 that allows you to pre-treat your own fabric. (Don’t want white? Choose a different light color.) The process is extremely easy and well worth the DIY, but what makes Bubble Jet a better choice is that it’s about 65-75% cheaper to use, it is definitely permanent (I have quilts that are 12 years old and they look great) and because it’s cheaper to use, you have less expense for mistakes. All of the printable fabrics should be rinsed to remove loose ink after printing, but if you follow directions carefully, the image will not wash out. (If it disappeared, you should be complaining to the manufacturer.) Bubble Jet Set can be purchased from various online locations, such as Soft Expressions, Dharma Trading and C. Jenkins and a single bottle will treat enough fabric to create roughly 75-80 printer sheets. Thank for the tips everyone!! I hope that whoever reads this tutorial can use them!! I’ve learned a lot and and am going to try a few of the techniques you guys suggested!! I just started making a photo quilt. I am using “printed treasures” paper. So far i am disapointed in how the pictures are turning out. Does anyone have a suggestion on how to make the picture quality better. The paper I’ve had the best results with is the June Tailor paper, you can buy it at craft stores, I got mine at Joanns. I use and Epson R1800 printer. It’s more pricey since it prints up to 12×12 paper. I think as long as you stick with a good quality photo printer you’ll be fine. I bought my printer 8 years ago and technology has come a long way since then (and prices have come down too). I think this is wonderful.It,s a memory quilt and a great gift, you could also print little family sayings or quotes, things that mean something,these may be put in a heart shape perhaps. This is my project for 2013, for my son and his glorious american wife.It,s been in my little project book for months you av given me the umph to get cracking.!! I’m confused. How do you cut an 8.5 x 11 inch piece of cloth into a 9 x 9 square?! You can’t. That’s why I ironed the photos onto 9×9 pieces of white fabric. Trim your photo down to 8×8 (it prints on a 8.5″ x 11″ size of fabric). Should u wash ur material before u start. Is 100 cotton the best??? I don’t ever pre wash my fabric, that is all personal preference though- I know many that do. Yes 100% cotton is the best! I have used the June Tailor product with success and no bleeding. I use an Epson printer and the inks are *supposed* to be fade proof, so that can’t hurt. But here is what I do to fully set the ink…..allow the photo to dry for at least 30 minutes after printing. Then with a hot, dry iron heat set the ink. Keep the iron moving but on the print for at least one minute. Allow to cool and soak the photo in lukewarm water. There may be a small bit of ink bleed but it shouldn’t be much. Don’t wring or twist but allow it to dry for about 10 minutes. Then heat set the ink one more time until the fabric is dry to the touch. I hopes this works for you! Thanks for all of the tips! I’ve had good luck with the June Tailor sheets in the past too- I think what I messed up on this project was not running them under water to release the extra ink. Thank you again! I really love your blog! Thanks for the inspiration. I love your quilt and I am so happy I found it! I just finished piecing a quilt top for my 1 year old and have a couple questions. I used June Tailor colorfast sheets and followed all the instructions to set the ink. For the first wash after it is finished should I wash it with no detergent or use a detergent like Dreft? I am so nervous the pictures will wash out after all that work! In the package it says you can use a bit of liquid fabric softener and it acts as a detergent. My other question is did you stipple over the pictures? I don’t know whether I should go around them or if I can go over them. Any suggestions to my questions would be great! I would wash it ONLY in Dreft or woolite ever! I wouldn’t ever use a regular detergent. I’d also try to see if it washes okay without soap. Sometimes all quilts need is a trip through the wash (even without soap) to get out dirt – Either way I’d use a Shout Color Catcher just in case. Good luck! Thanks so much for your reply! Did you stipple over the pictures or go around them? Nice tutorial! 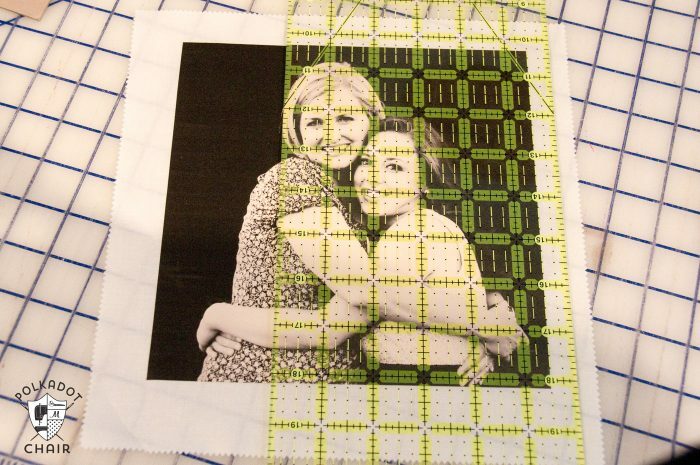 Thanks for sharing…one question…once you iron your photos onto the white 9×9 fabric, how do you get them to adhere? 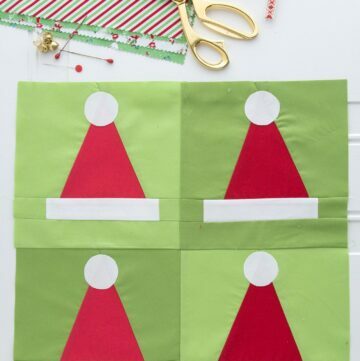 Do you use an appliqué or other decorative stitch around edges before you sew all squares together? Kinda a newbie but how or what did you use to print the picture on the fabric? Hi! I really love your photo lap quilt and was wondering how big the entire quilt was? 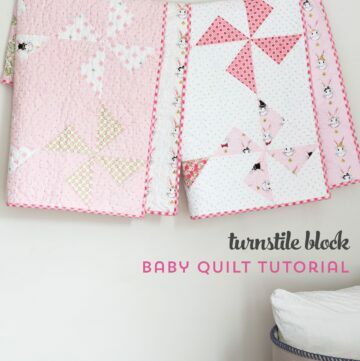 I would like to make a baby quilt, but not sure if this one will turn out to be too big. Might just go for it anyways. Thanks for the tutorial ? Hello,I check your blogs named “Twitter” regularly.Your writing style is witty, keep it up! And you can look our website about proxy list. You can use freezer paper to for photos. Also use clear Krylon spray to secure photos. Works great. i would like to get your pattered but i have no way of doing it . so i was wondering if maybe u could send it to 1172 CO.RT85 Oswego,ny13126. if u can then i thank u so much. if u cant then i guess ill understand. I would like the pattern for this photo quilt, also. I have a grandson that is graduating from High School. Would love to make him one. 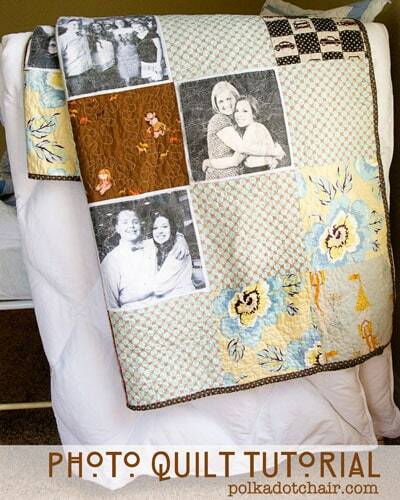 I would love to make a quilt similar to this for my aunt who is battling lung cancer. What is the best picture process to be able to wash the quilt (almost weekly) with minimal picture fading?